Zogby Research Services (ZRS) has released a poll assessing President Morsi's popularity one year after his inauguration, finding a drop in popularity from 57% to 28% over the course of the year. The Muslim Brotherhood’s Freedom and Justice Party, which garnered 47% of total parliamentary seats in 2011, currently holds a popularity rate of 26%, the poll’s findings suggest. The survey sample consisted of 5,029 Egyptian adults nationwide and was conducted from 4 April to 12 May 2013, ZRS explained. In a survey conducted one year ago by the same institute, 57% of Egyptians said Morsi’s victory was either “a positive development” or “the result of a democratic election and the results need to be respected,” in comparison to only 28% this year. The National Salvation Front (NSF), the main opposition coalition, holds 35% support, while 40% of the total population do not have confidence in either the government or any political party, the poll revealed. The survey also stated that 94% of Egyptians expressed confidence in the army. The survey's results precede anticipated mass demonstrations on 30 June, which will demand early presidential elections. The anti-Morsi 'Rebel' campaign – the first group to call for demonstrations – was launched in May with the intention to precipitate elections by collecting 15 million signatures in a vote of "no confidence" in Morsi. 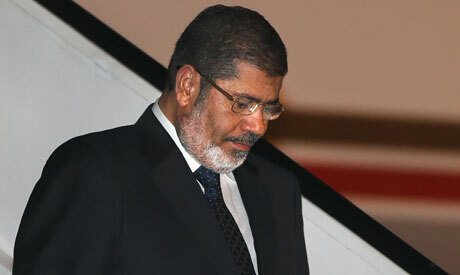 Morsi was elected one year ago with 13 million votes. The campaign, which announced 29 May that seven million signatures had already been collected, called for the mass protests to coincide with Morsi's first anniversary in power. The campaign has accused the president's administration of "failing to implement policies that improve the life of ordinary people." The Ikhwan are not Islam. The Salafis are not Islam. Before you write comments like this, ask yourself why the Ikhwan, Morsi, and the Salafis are always allied with the Zionists you claim fund these surveys. Morsi brokered a cease fire that Israel and its American backer loved. Morsi, his Ikhwan, and the Salafis are supporting Israel's and the United States's war against Al-Assad and Iran. Morsi and the Ikhwan are the lapdogs of the duplicitous Qataris that do business with Israel and champion its causes. If you choose to live in ignorance, that's your business. But don't spoil your lies and vitriol. The figure installed President Mohamed Morsi is undisputed . Mr Cameron of United Kingdom rules with 8 percent of the vote. The Egyptians who did not vote for President Morsi do not leave another planet they in fact remain subject of MB. That is why they enjoy freedoms never known to Egyptian before. Amr Mousa had 4 percent of the vote. Never mind rest of falools . A recent poll showed that none of the NSf enjoyed more than 2 percent of votes if they were elections. That is why they object to parliamentary elections and resort to violence and destruction. If anti Islam camp dispute democratic rules to govern us then indeed Islam is the Solution. You may as well get ready water to purify yourselves before taking the Shahada. What is wrong with the 26 and 28% of citizens who still support the Brothers and Morsi? Do they need medical treatment or do they live on a different planet to the rest of the disillusioned Egyptians!